In January 1978, Boeing announced a major extension of its Everett factorywhich was then dedicated to manufacturing the 747to accommodate its new wide-body family. In February 1978, the new jetliner received the 767 model designation, and three variants were planned: a 767-100 with 190 seats, a 767-200 with 210 seats, and a trijet 767MR/LR version with 200 seats intended for intercontinental routes. The 767MR/LR was subsequently renamed 777 for differentiation purposes. The 767 was officially launched on July 14, 1978, when United Airlines ordered 30 of the 767-200 variant, followed by 50 more 767-200 orders from American Airlines and Delta Air Lines later that year. The 767-100 was ultimately not offered for sale, as its capacity was too close to the 757's seating, while the 777 trijet was eventually dropped in favor of standardizing around the twinjet configuration. In December 2011, FedEx Express announced a 767-300F order for 27 aircraft to replace its DC-10 freighters, citing the USAF tanker order and Boeing's decision to continue production as contributing factors. FedEx Express agreed to buy 19 more of the 300F variant in June 2012. In June 2015, FedEx said it was accelerating retirements of planes both to reflect demand and to modernize its fleet, recording charges of $276 million. On July 21, 2015 FedEx announced an order for 50 767-300F with options on another 50, the largest order for the type. With the announcement FedEx confirmed that it has firm orders for 106 of the freighters for delivery between 2018 and 2023. In February 2018, UPS announced that they were ordering 4 more 767-300Fs, increasing their total order to 63. Deliveries are scheduled from 2017 through 2022. The 767 features a twin-aisle cabin with a typical configuration of six abreast in business class and seven across in economy. The standard seven abreast, 232 economy class layout places approximately 87 percent of all seats at a window or aisle. As a result, the aircraft can be largely occupied before center seats need to be filled, and each passenger is no more than one seat from the aisle. It is possible to configure the aircraft with extra seats for up to an eight abreast configuration, but this is less common. When referring to different variants, Boeing and airlines often collapse the model number (767) and the variant designator (e.g. 200 or 300) into a truncated form (e.g. "762" or "763"). Subsequent to the capacity number, designations may append the range identifier. The International Civil Aviation Organization (ICAO) aircraft type designator system uses a similar numbering scheme, but adds a preceding manufacturer letter; all variants based on the 767-200 and 767-300 are classified under the codes "B762" and "B763"; the 767-400ER receives the designation of "B764". The 767-200 was the original model and entered service with United Airlines in 1982. The type has been used primarily by mainline U.S. carriers for domestic routes between major hub centers such as Los Angeles to Washington. The 767-200 was the first aircraft to be used on transatlantic ETOPS flights, beginning with TWA on February 1, 1985 under 90-minute diversion rules. Deliveries for the variant totaled 128 aircraft. There were 52 passenger and freighter conversions of the model in commercial service as of July 2018[update]. The type's competitors included the Airbus A300 and A310. The 767-200 variant was the only variant in the series to use Pratt & Whitney JT9D engines, as all other models used the newer Pratt & Whitney PW4000 engines. The FAA granted approval for the 767-400ER to operate 180-minute ETOPS flights before it entered service. Because its fuel capacity was not increased over preceding models, the 767-400ER has a range of 5,625 nautical miles (10,418 km), less than previous extended-range 767s. This is roughly the distance from Shenzhen to Seattle. No 767-400 version was developed, while a longer-range version, the 767-400ERX, was offered for sale in 2000 before it was cancelled a year later, leaving the 767-400ER as the sole version of the largest 767. Boeing dropped the 767-400ER and the -200ER from its pricing list in 2014. A total of 37 aircraft were delivered to the variant's two airline customers, Continental Airlines (now merged with United Airlines) and Delta Air Lines, with no unfilled orders. All 37 examples of the -400ER were in service in July 2018. One additional example was produced as a military testbed, and later sold as a VIP transport. The type's closest competitor is the Airbus A330-200. Airborne Surveillance Testbed the Airborne Optical Adjunct (AOA) was modified from the prototype 767-200 for a United States Army program, under a contract signed with the Strategic Air Command in July 1984. Intended to evaluate the feasibility of using airborne optical sensors to detect and track hostile intercontinental ballistic missiles, the modified aircraft first flew on August 21, 1987. Alterations included a large "cupola" or hump on the top of the aircraft from above the cockpit to just behind the trailing edge of the wings, and a pair of ventral fins below the rear fuselage. Inside the cupola was a suite of infrared seekers used for tracking theater ballistic missile launches. The aircraft was later renamed as the Airborne Surveillance Testbed (AST). Following the end of the AST program in 2002, the aircraft was retired for scrapping. E-767 the Airborne Early Warning and Control (AWACS) platform for the Japan Self-Defense Forces; it is essentially the Boeing E-3 Sentry mission package on a 767-200ER platform. E-767 modifications, completed on 767-200ERs flown from the Everett factory to Boeing Integrated Defense Systems in Wichita, Kansas, include strengthening to accommodate a dorsal surveillance radar system, engine nacelle alterations, as well as electrical and interior changes. Japan operates four E-767s. The first E-767s were delivered in March 1998. KC-767 Advanced Tanker the 767-200ER-based aerial tanker developed for the USAF KC-X tanker competition. It is an updated version of the KC-767, originally selected as the USAF's new tanker aircraft in 2003, designated KC-767A, and then dropped amid conflict of interest allegations. The KC-767 Advanced Tanker is derived from studies for a longer-range cargo version of the 767-200ER, and features a fly-by-wire refueling boom, a remote vision refueling system, and a 767-400ER-based flight deck with LCD screens and head-up displays. Boeing was awarded the KC-X contract to build a 767-based tanker, to be designated KC-46A, in February 2011. KC-767 Tanker Transport the 767-200ER-based aerial refueling platform operated by the Italian Air Force (Aeronautica Militare), and the Japan Self-Defense Forces. Modifications conducted by Boeing Integrated Defense Systems include the addition of a fly-by-wire refueling boom, strengthened flaps, and optional auxiliary fuel tanks, as well as structural reinforcement and modified avionics. The four KC-767Js ordered by Japan have been delivered. The Aeronautica Militare received the first of its four KC-767As in January 2011. Tanker conversions the 767 MMTT or Multi-Mission Tanker Transport is a 767-200ER-based aircraft operated by the Colombian Air Force (Fuerza Aérea Colombiana) and modified by Israel Aerospace Industries. In 2013, the Brazilian Air Force ordered two 767-300ER tanker conversions from IAI for its KC-X2 program. As new 767s roll off the assembly line, older models have been retired and stored or scrapped. One complete aircraft, N102DAthe first 767-200 to operate for Delta Air Lines and the twelfth example built, is currently on display. It was withdrawn from use and stored at HartsfieldJackson Atlanta International Airport in 2006. The exhibition aircraft, named "The Spirit of Delta" by the employees who helped purchase it in 1982, underwent restoration at the Delta Flight Museum in Atlanta, Georgia. The restoration was completed in 2010. ^ a b c d e f g h i j k l "767 Model Summary (orders and deliveries)". Boeing. February 2019. Retrieved March 12, 2019. ^ a b c d e f g h "World Airline Census 2018". Flightglobal.com. Retrieved 2018-08-21. ^ a b c d e f Norris & Wagner 1998, pp. 15657. ^ a b c d e f g h i j k l m n o p q r s t u Velupillai, David (August 8, 1981). "Boeing 767: The new fuel saver". Flight International. pp. 43637, 439, 44041, 44548, 453. Retrieved July 30, 2011. ^ a b "History of the 767 Two-Crew Flight Deck". Boeing. Archived from the original on 2011-08-07. Retrieved July 29, 2011. ^ a b c d e f g h i j k l m "Boeing 767 Program Background". Boeing. Archived from the original on 2011-08-21. Retrieved July 30, 2011. ^ a b c d e Haenggi 2003, pp. 3840. ^ a b c d e f g h i j Eden 2008, pp. 10304. ^ a b Norris, Guy; Kingsley-Jones, Max (January 4, 2003). "Long players". Flight International. Archived from the original on 2013-09-25. Retrieved July 30, 2011. ^ "Sonic Cruiser seeks mission definition". Interavia Business & Technology. 56 (655): 25. July 2001. Archived from the original on 2015-09-24. Retrieved June 30, 2015 – via HighBeam. (Subscription required (help)). ^ a b c d e Norris, Guy (November 7, 2006). "Pumped for action". Flight International. Archived from the original on 2007-07-04. Retrieved August 30, 2011. ^ a b c Shalal-Esa, Andrea (February 24, 2010). "Pentagon nears new contract in air tanker saga". Reuters. Archived from the original on 2012-11-13. Retrieved December 26, 2011. ^ a b c Hoyle, Craig (January 14, 2010). "Japan receives last Boeing KC-767 tanker". Flight International. Archived from the original on 2010-01-18. Retrieved August 18, 2011. ^ a b "Boeing 787 Dreamliner Aircraft Profile". Flight International. 2011. Archived from the original on 2011-09-06. Retrieved July 30, 2011. ^ "767 earns reprieve as 787 ramp-up considered". Flight International. June 5, 2005. Archived from the original on 2012-11-05. Retrieved July 30, 2011. ^ Ionides, Nicholes (September 17, 2008). "JAL to take 11 767s and 777s in 787-delay compensation deal". Flight International. Archived from the original on 2008-09-21. Retrieved September 15, 2011. ^ Goold, Ian (June 2010). "Checking Up on the 767". MRO Management. Archived from the original on 2012-04-26. Retrieved 2015-07-03. ^ Walker, Karen (October 27, 2011). "Finally ... the 787 enters service". Air Transport World. Archived from the original on 2011-12-27. Retrieved December 9, 2011. ^ a b Ranson, Lori (July 22, 2008). "Blended winglets debut on Boeing 767". Flight International. Archived from the original on 2008-07-25. Retrieved August 19, 2011. ^ Yeo, Ghim-Lay (July 23, 2010). "Farnborough: Hainan and ANA to equip Boeing aircraft with winglets". Flight Daily News. Archived from the original on 2010-07-26. Retrieved August 19, 2011. ^ "Delta takes tips from Aviation Partners". Flight Daily News. June 20, 2007. Archived from the original on 2013-10-03. Retrieved August 19, 2011. ^ a b Ostrower, Jon (February 3, 2011). "Boeing unveils 1,000th 767". Air Transport Intelligence. Archived from the original on 2011-02-06. Retrieved February 6, 2011. ^ "Thousandth 767 etches twinjet's place in history". Flight International. December 1, 2010. Archived from the original on 2014-02-28. Retrieved January 20, 2011. ^ "FedEx to buy additional aircraft from Boeing". Businessweek. Associated Press. June 29, 2012. Archived from the original on 2012-07-03. Retrieved 2015-07-03. 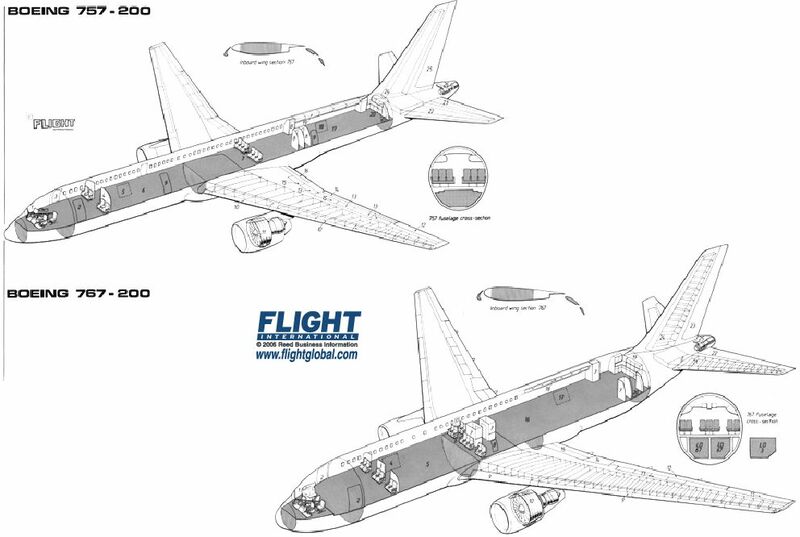 ^ a b "FedEx to Buy as Many as 100 Boeing 767 Freighters". The Wall Street Journal. 21 July 2015. Retrieved 21 July 2015. ^ a b "Boeing: UPS Orders 14 Additional 747-8 Freighters, Plus Four 767 Freighters". www.boeing.com. Retrieved 2018-03-10. ^ "Boeing's tactical option for MOM sector". Leeham. Aug 14, 2017. ^ "Boeing ponders restart of 767-300ER passenger line". Leeham. Oct 19, 2017. ^ Stephen Trimble (6 Nov 2017). "United requests pricing data on 767, other widebodies". Flightglobal. ^ Tim Hepher (5 March 2018). "Boeing executive rules out reviving 767 passenger jet". Reuters. ^ Edward Russell (5 March 2018). "Boeing unlikely to resume passenger 767 production". Flightglobal. ^ Birtles 1999, pp. 1516. ^ Warwick, Graham (July 10, 2012). "Boeing's KC-46A Tanker Sparks 767 Cockpit Upgrade". Aviation Week & Space Technology. Archived from the original on February 21, 2014. Retrieved 2015-07-04. ^ "Waterman, A. 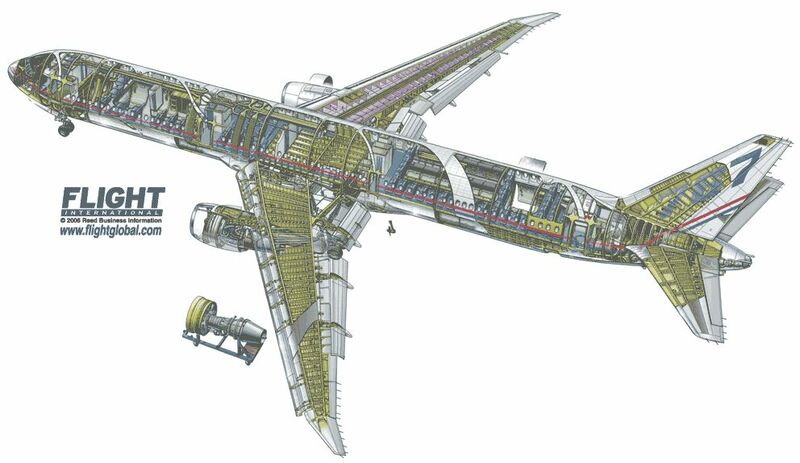 ''The Boeing 767 Hydraulic System'', SAE International". Papers.sae.org. 1983-10-03. Retrieved 2018-11-17. ^ "Thomsonfly.com Launches Enhanced Interior Package for Boeing 757-200 and 767-200". Boeing. March 9, 2005. Retrieved 2015-07-04. ^ "B767 Interior Upgrade Systems". Heath Tecna. Archived from the original on 2011-10-01. Retrieved August 18, 2011. ^ a b c "Federal Aviation Administration Type Certificate Data Sheet A1NM" (PDF). Federal Aviation Administration. March 4, 2011. pp. 68. Retrieved December 26, 2011. ^ "Boeing 767-200ER". Continental Airlines. 2011. Archived from the original on 2011-08-05. Retrieved 2015-07-04. ^ a b c d Trimble, Stephen (28 December 2014). "Boeing completes first flight of new freighter and tanker". Flightglobal. Reed Business Information. Archived from the original on December 30, 2014. Retrieved 30 December 2014. ^ a b Francis, Leithen (June 16, 2008). "ST Aero delivers world's first 767-300BCF to All Nippon Airways". Flight International. Archived from the original on 2008-06-19. Retrieved August 19, 2011. ^ "Boeing 767-400ER gets FAA clearance". Flight International. July 25, 2000. Archived from the original on 2013-09-29. Retrieved February 1, 2011. ^ "Shenzhen to Seattle distance". Great Circle Mapper. ^ a b Sarsfield, Kate (January 27, 2009). "Bahrain acquires 767-400ER testbed for VIP use". Flight International. Archived from the original on 2009-01-30. Retrieved January 21, 2011. ^ "Boeing Offers KC-767 Advanced Tanker to US Air Force". Boeing. February 12, 2007. Archived from the original on 2007-02-14. Retrieved 2015-07-04. ^ "Il portale dell'Aeronautica Militare KC-767A". difesa.it. Archived from the original on March 25, 2015. Retrieved April 1, 2015. ^ Egozi, Arie (June 9, 2010). "IAI tests Colombia's new 767 tanker". Flight International. Archived from the original on 2010-09-09. Retrieved September 2, 2011. ^ "TSA Travel Assistant". US Transportation Security Administration. September 26, 2006. Archived from the original on 2011-05-11. Retrieved January 20, 2011. ^ "GE alerts airlines about engine part after American Airlines fire". Reuters. Retrieved 6 November 2016. ^ CNN, Steve Almasy and Hollie Silverman. "Cargo jet with 3 aboard crashes in Texas". CNN. Retrieved 2019-02-23. ^ a b c "767 Airplane Characteristics for Airport Planning" (PDF). Boeing. May 2011. pp. 2329. ^ a b c d e f g "767 Airplane Characteristics for Airport Planning" (PDF). Boeing. May 2011. pp. 914. ^ a b c "767 Airplane Characteristics for Airport Planning" (PDF). Boeing. May 2011. pp. 1518. Kane, Robert M. (2003). Air Transportation 19032003. 14th ed.. Dubuque, Iowa: Kendall Hunt Publishing. ISBN 978-0-7872-8881-5. Taylor, John W.R., ed. (1989). Jane's All the World's Aircraft 198990. London: Jane's Yearbooks. ISBN 0-7106-0896-9. Wilson, Stewart (2002). Ansett: The Story of the Rise and Fall of Ansett, 19362002. Weston Creek, Australian Capital Territory: Aerospace Publications. ISBN 978-1-875671-57-1. This article based on this article: Boeing_767 from the free encyclopedia Wikipedia and work with the GNU Free Documentation License. In Wikipedia is this list of the authors .